Xinhuanet.com reports that a new law has been passed in Gansu province in north-western China mandating disclosure within a month of diagnosis. The short article makes it clear that non-disclosure will result a prosecution for "deliberate" HIV transmission, although the penalties are not clear. A regulation adopted by the provincial health department requires HIV carriers and AIDS patients to inform their sexual partners within a month after they get their HIV test results, said Wang Xiaoming, vice director of the department on Wednesday. It also stipulates that HIV carriers and AIDS patients have a responsibility to persuade their sexual partners into receiving counselling and test. 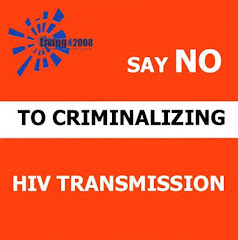 Violation of the regulation would be seen as deliberate spread of AIDS and the violators would be punished according to law, Wang said. Policymakers in Gansu province in north-western China are proposing to pass a law that makes disclosure of HIV-positive status mandatory within four weeks of diagnosis; if not they "face a lawsuit." China Daily reports that the measures are "widely considered well-intentioned but unrealistic." The regulation, now still a draft, issued by the Gansu health department on Monday, stipulates that upon getting the HIV confirmation from the clinics, the sufferer must tell his or her partners within a month about the infection, or face a lawsuit. "The requirement featuring a one-month time limit is not human-oriented as sufferers who first learn of their HIV status need time to accept the harsh reality, let alone informing others of their condition," said He Tiantian, who heads the Women's Network against AIDS - China, a civil society supporting females living with HIV/AIDS. "Some give fake documents to protect their privacy," said Professor Jing Jun with Tsinghua University. Among the 700,000 HIV/AIDS sufferers in China, only 270,000 can be tracked, he said. Regional surveys in the country showed that only one-third of the newly diagnosed HIV sufferers would disclose their infection to their partners. "The Gansu regulation is good in intention while unrealistic in practice," he noted. Those most likely to tell their partners are those who have been married for a long time. Other sufferers, especially prostitutes, often fail to inform their partners about the infection, he said. Of note, the report does not mention a law proposed by the Chinese government in 2006, to prosecute "deliberate" HIV transmission. The two, are, of course related: in too many jurisdictions non-disclosure (even in the absence of significant risk, and definitely in the absence of transmission) is currently criminalised.